Northwestern Theological Seminary is a non-profit online Christian seminary offering affordable and convenient theologically accredited and state authorized Christian educational programs at Bachelor, Master, and Doctorate levels. Review our programs. A leading internet based Christian theological online seminary, Northwestern Theological Seminary is a recognized top ranking online school with students located in many countries around the world. Study your degree program in your own time, from anywhere in the world. With year round open enrollments, you can balance your study and lifestyle. No need to wait for a new semester to start. Begin your programs as soon as you complete your enrollment. A Northwestern Theological Seminary education allows you the freedom and flexibility you need to get the affordable online seminary education you deserve. Learn on your time! Northwestern Theological Seminary also sponsors one of the most recognized, state of the art, free access online Christian libraries available on the internet. 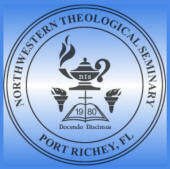 The NTSLibrary is used by online seminary students of Northwestern as well as students of other schools who continue to link to it as a leading resource in their studies. The Northwestern Theological Seminary Accelerated Degree Program enables academically qualified online students to earn a Master or Doctorate Degree in a relatively short time - graduating sooner than they would in traditional degree programs. Find out how you can earn your Master of Theology or Doctor of Philosophy, or a combination of both, in a number of degree majors that include Theology, Biblical Studies, Christian Counseling, and more. If qualified, you can earn your degree in as little as 12 weeks to 1 year. OUR ONLINE SEMINARY COURSE MANAGEMENT SYSTEM - NOW LAUNCHED! Moodle has undergone evaluation and has been chosen to be the best Online Seminary CMS (Course Management System) to meet the needs of the faculty and students at NTS. >>What is Moodle? Moodle is an open source online learning system with a large and active support and user community recognized around the world. This helps educators create effective online learning communities. >>Who Uses Moodle? Moodle is becoming the online Learning Management System of choice. Internationally, universities which have adopted MOODLE include University of California at Los Angeles (UCLA), Athabasca Open University of Canada, the Open University of the U.K., Glasgow University, the University of Southern Queensland, and in New Zealand, Massey and The University of Canterbury. >>Who Uses Moodle? The Moodle Course Management System has proven to be a reliable and more user friendly program. After evaluation of the alternative programs, the Advisory Board of Northwestern Theological Seminary has come to the same conclusion as that of other leading universities and colleges, that the Moodle System is the best choice for offering courses online, meeting the need of our online seminary.